From the Chronicle: Chip Johnson’s Friday column substantiates the rumor from a couple of weeks ago in which Wolff scrapped his original vision for something smaller. That’s the good news. The bad news? He’s not funding the project entirely himself. The City of Oakland came up with the two site alternatives, both of which amount to 30 acres each. Coliseum North Jr.: Between 50th and 66th Avenues along I-880/San Leandro St. I am coining it Coliseum North II because it essentially is a smaller version of Wolff’s original site. It may be pieced together from land in which the City found willing sellers. What’s not known is how the site is situated along that industrial stretch. Its proximity to Coliseum BART will be key. The site is in the lower right quadrant of the picture below. 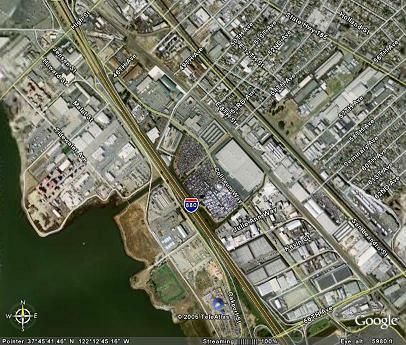 Tidewater/Oakport/High St. Estuary: This is essentially across the Nimitz (I-880) from Coliseum North. It’s an industrial area with one intriguing fact: 11 acres of it is owned by the East Bay Regional Parks District. PG&E has a 15-acre facility across the street. The site is obviously not very close to BART. The site is in the upper left quadrant of the picture below. Here’s where it gets tricky. These two sites’ size makes the idea of private development being used to completely foot the bill for stadium construction not feasible. Wolff has proposed that the City/County/Coliseum Authority acquire the land, while the A’s would put at least $25 per square foot towards the cost. That equates to $1 million per acre, which is below market value for industrial land in the Bay Area. The hope is that surrounding development could help pay for land acquisition and construction, but there’s no illusion that it will provide all of the necessary funds. Wolff’s new plan sounds reminiscent of the DC ballpark plan, in which the District acquired the site, designated a portion of it for the ballpark and the rest for developers. In its haste the District controversially went the eminent domain route, which I wouldn’t expect for this effort, especially during an election year. The hard part is figuring out how much public money has to be raised for it, which someone at the City Center will have to figure out. Having local pols back the plan is another issue altogether. Of the two sites, the Tidewater site looks the most intriguing. It’s waterfront, there are fewer property owners, and one large piece is already owned by a public agency. The EBParks land won’t be free – Oakland/Alameda County/Coliseum Authority would have to buy it – but if a deal could be worked out that provides open space or parkland, it could be beneficial to all parties. The PG&E site’s a different story. It’s not a substation like the situation in San Jose. It’s a local operations center, complete with a vehicle yard, dispatch, and customer service. If the City can find a large, suitable piece of land on which PG&E can relocate, it could work, but the costs associated with that land acquisition/swap and relocation costs have to be factored into the total cost of the plan. One last interesting factoid: Coliseum North is in Larry Reid’s district, while Tidewater is in Ignacio De La Fuente’s district.